I've been thinking lately about aroids (it's a nice break from thinking about ice cream). Aroids are plants in the family Araceae (a-RAY-see-ay)... a great word for Scrabble when you have a lot of vowels, and a fascinating group of plants. The defining feature of aroids is that their sexual organs are on a structure called a spadix, which usually is covered or enclosed by a modified leaf called the spathe (the "Jack" and the "pulpit"). The 107 genera of this family are mostly tropical and sub-tropical (think anthuriums), so here's the surprising part: we grow seven different genera here in our garden as hardy perennials in zone 5a. We grow roughly (I'm too lazy to go count them... what do you expect in a free blog), thirty species altogether. Here are the genera we grow: arisaema, arum, pinellia, arisarum, dracunculus, and sauromatum (typhonium). The plants themselves are very cool, and the "flowers" are even cooler... many of them look like snakes rising out of the ground when they first come up, and some have fabulously spotted stems, with very tropical apearing leaves. No group of plants in our garden, save perhaps the hardy orchids, gives me more pleasure, wandering about the pathways examining each plant in its various stages of growth. The aroids certainly give me the most prolonged pleasure, as the arums stay in leaf all winter, so some member of this family will be in leaf or bloom twelve months of the year... as close to all season gardening as we'll ever come in the upper midwest. 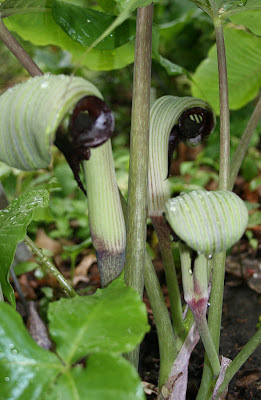 Above is Arisaema ringens, from Korea and Japan; the spathe is deeply hooded, and the leaves of this plant are large and healthy appearing... this might be the single most vigorous and easy of the Asian jacks for most gardeners; it grows into large clumps very quickly, with no finicky coddling needed. Iboy, I live not to far from you in Muscatine. Last fall I collected a few Arisaema triphyllum to try and germinate.I planted 6 of them on Nov.25, and so far 2 have actually germinated.The rest are being held in the refrigerator till spring for germination outside.